We’ve had island beds, transverse island beds, single beds… so you can guess what’s coming here: transverse single beds! But, it’s over £31,000 and, while it exudes an air of pure quality, it’s also some 2.45m (8ft) wide. This is serious stuff, indeed, and definitely not for the faint-hearted. 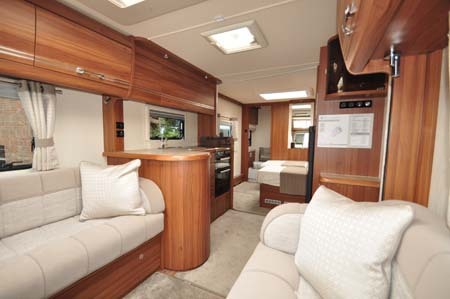 From Elddis’s flagship Buccaneer range, there’s little that’s discreet about a tourer like this. 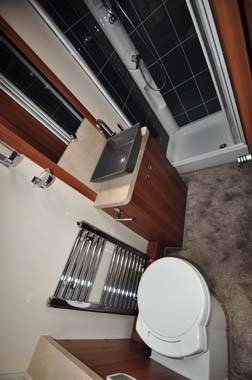 It’s certainly a unique floorplan, with its extending twin single bed arrangement and full-width washroom beyond. That means, when the beds aren’t needed, there’s sufficient space at the foot end of each to get past easily on your way to the washroom. They’re different lengths, but the larger of the two, is some 1.97m (6ft 6in), with the other 1.87m – and, of course, there’s still room to dangle your feet out at the end of each. Both are 0.70m wide, with a handy chest of drawers in between. Overhead, there’s a Heki rooflight, two lockers over the padded headboards and a pleated divider extending across to complete the privacy. The lounge seating doesn’t stint either – those settees are 1.81m long and, if the resultant two further single beds here aren’t sufficient you can also make them into a truly king-size double. That full-scale washroom across the back is accessed via a sliding door. There’s a chrome heated towel rail in here, plus a free-standing basin with swan neck mixer tap. There’s also a step-in shower cubicle with tile-effect wall lining (although it flexes, which rather spoils the effect) and a fancy Ecocamel Orbit showerhead, as well as a clothes airer. Plenty of other details are to hand in this washroom, too, including toilet roll and soap holders, and toothbrush mug. There’s also an opaque window, a feature that always helps with ventilation in a room like this. The kitchen is ‘midships’ and L-shaped, helping to optimise both worktop area and low-level storage space. There’s a full cooker here, of course, with dual-fuel hob as well as separate oven and grill, although it’s perhaps surprising to see there’s not a permanent drainer alongside the granite-style sink – especially considering the facilities extend to an extra-thick, wood-edged kitchen worktop and stylish mixer tap. Across the galley is Dometic’s largest 8-series fridge (with a capacity of some 155 litres) with removable freezer box (ideal if you want all the space for a larder). There’s space above this for a Daewoo microwave oven that’s still at an acceptable height. There’s a wardrobe to the left of the fridge and microwave, set over two drawers and a floor locker. There’s a darker tone to the woodwork and a slight curve to the seating where it meets the central chest of drawers. Lots of complementary chromed detailing highlights the special nature of this tourer. Heavy-duty corner steadies are the only hint of what’s more than just a party trick for this top tourer. 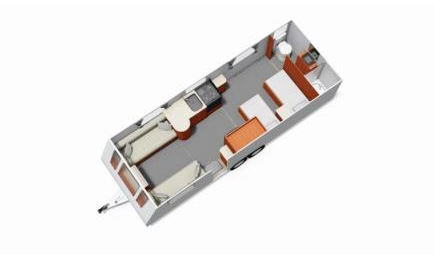 It boasts a remote control levelling system care of E & P Hydraulics, which means your caravan really can be pitched and levelled in just a couple of minutes maximum. There’s plenty more. The Alde heating and hot water system extends to underfloor warming. It’s all fully programmable and can also be set up remotely via your smartphone. It’s all about equipment levels in a unit like this, too. Hence items such as the 100Watt solar panel, Aquaclean upholstery, stereo radio with MP3 and Bluetooth connectivity, all kinds of LED lighting (including illumination for the drinks cabinet and gas locker), external barbecue and satellite TV points… the list simply goes on and on! It’s all made using Elddis’s SoLiD bodywork construction, of course, featuring silver sides, tinted windows, darkened alloy wheels, fixed front sunroof and, underpinning it all, BPW’s superior Swing V-tec chassis with shock absorbers, should mean a very well-behaved unit on the road – it also includes iDC anti-snaking. This really is the touring caravan that’s got everything, including the price tag. Verdict: Caravan that has it all... for the caravanner that wants it all. 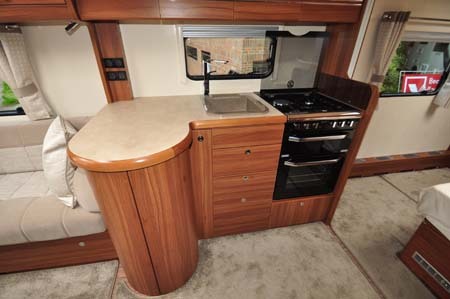 There’s more information on the Buccaneer range on the Elddis website. To find out more about our low-cost premiums visit the caravan insurance discounts page. Safety & security Phantom ProActive 3 tracking system, BPW Diamond wheel lock, PIR alarm system, iDC (Intelligent Drive Control), CRiS registration, smoke alarm, carbon monoxide detector, single key for external locks. 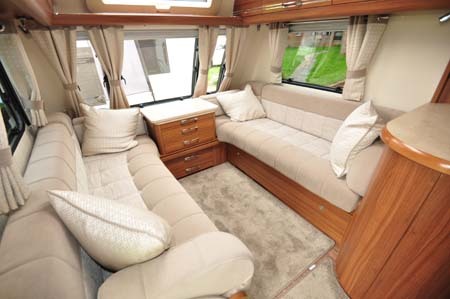 Key options Leather upholstery (£1,249), wrap-around front seating (£199), additional locker shelving kit (£39), Teleco satellite dish (£1,499), Truma air conditioning (£1,299), bedding covers and duvets kit (£249). 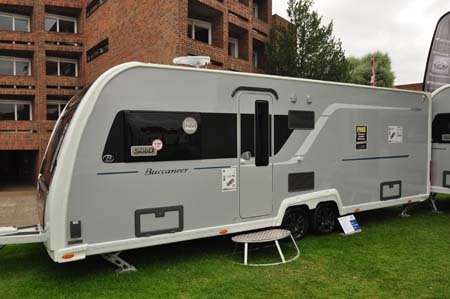 *Caravan insurance cost based on Bucaneer Clipper caravan retailing at £31,394, fitted with Phantom Proactive 3 tracking system, PIR alarm system, hitchlock, BPW Diamond wheel lock and iDC anti-snaking. Kept on drive at HX4 0BE. Caravanners over 30 years old, claim free for 3 years and a member of a caravanning club. £100 excess. 180 days European cover and up to £75 per day for up to 15 days emergency accommodation cover included. Legal expenses cover, extended European cover and other emergency accommodation expenses cover options are available at extra cost. Quote includes 10% online discount and 9.5% Insurance Premium Tax and is correct as of 27.11.15. We took delivery of our 2016 Clipper in April and have had it out a couple of times. Standard of finish generally is very good, let down by bathroom top cupboards which smack the wall/ washroom door opening unless you are careful and a flimsy washroom door catch. Full marks to Elddis for recognising that some buyers don’t want to share a bed with their partner. (Perhaps an age thing?!) Suits us at home and suits us in the ‘van. Pleased that a mover did not come as standard – some buyers will be anxious about the added weight and use storage/sites where it is not required. Our 2011 Supercyclone had a bigger and better fridge/freezer made possible by the microwave being above the hob so we feel the change in 2016 is a step backwards. Otherwise loads of storage internally. 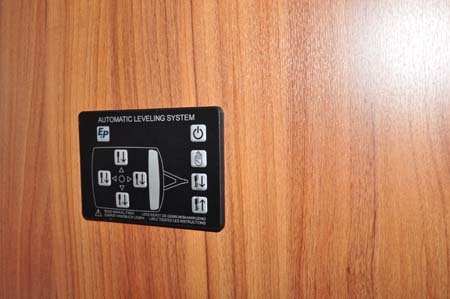 The front locker could be redesigned to take a waste hog / Aquaroll with very little effort – the door is just a little shallow. The extra width does not feel obvious when on the road (yet to go anywhere narrow) but bear in mind that it is also longer than its predecessors. In summary, pleased so far (wish that we had specced standard plain curtains when we took the leather option which comes with purple floral curtains and blinds. Purple! Expensive? Of course it’s expensive. It’s entitled to be with a specification like that. 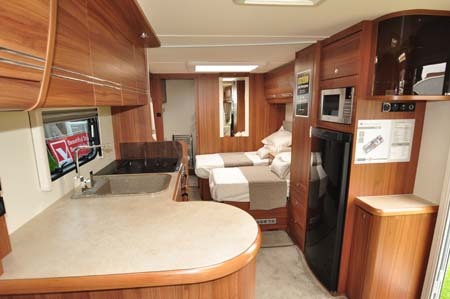 It is about time caravans like this are offered with factory fitted movers, hopefully to save a little money compared to aftermarket prices. As Arthur says, it’s “essential” and frankly necessary on any twin-axle van. I have to laugh about the beds. Great that they’re transverse but twin beds? That probably says more about the targeted market than anything else. What’s wrong with a lovely, wide double; 4ft 8″ minimum I’d say, although one-day manufacturers will be offering a 5ft transverse double. 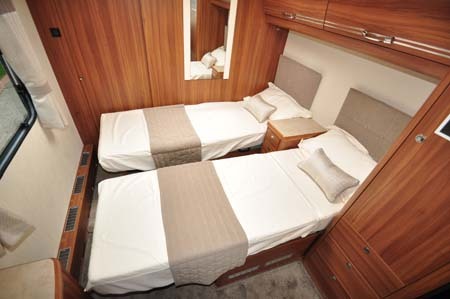 Adria did a large fixed double with their Adora 642UP (option to push the twins together and fixed) but sadly, they don’t appear to offer that layout anymore. Mind you, it wasn’t transverse and one had to climb on from the bed-end! If you don’t like the advantages of a double bed, ask the doctor for some pills! The remote-control leveller does sound wonderful and I confess I’d really like that. Something to align the wheels for locking would make it amazing. Does such a thing exist, yet? In the meantime, we remain in love with our Bailey Unicorn III Cartagena. For approx £7K+ less, it’s still a winner. Thank you for your comments. We can confirm that the Buccaneer range comes with 100W Solar Panel as standard, along with class-leading specification such as: LevelSystem RC Automatic self-levelling, ALDE Underfloor heating and telemetric controls for ALDE via the Phantom Tracker (meaning you can program said heating/hot water via your mobile phone). Teleco satellite systems can be fitted as an option, as can motormovers. Please speak to your Buccaneer retailer to find the most suitable for your needs. Already has a 100w solar panel ?? Yes it does Arthur. It has a 100W Truma roof-mounted solar panel as standard. And Margarita Elddis offer a Teleco self-seeking satellite dish as a retailer fit option at a cost of £1,499. I’m sure also a dealer would be able to sort out a motor mover. I’ve not heard of any new caravan that comes with a motor mover as standard to be honest but would be interested to know if there is one. If you are ever in the market for a motor mover, please check out our guide to compare caravan motor movers. By far now the best caravan manufacturer in the market place. The Clipper with the double bed in the one for us when we change shortly. Add a motor mover, sat cable system and solar panel. That’s it!! !